Dave Rosage has a Bachelor’s Degree in Business Administration from Stevenson University and an M.B.A. from Loyola College of Maryland. He currently serves on the Board of the South County Chamber of Commerce, is a Maryland Free Mason and an avid reader. Dave brings to Skipper’s a lifelong passion for business and true entrepreneurial spirit. He is very attentive to guests and stands 100% committed to the high standard of dining here at Skipper’s – from the fresh and innovative cuisine, to the fast and friendly service he insists from his staff. Dave also owns several small business enterprises in Northern Anne Arundel County. Jessica Rosage graduated from Johnson and Wales University in Charlotte with a Bachelor’s Degree in Food Service Management. She is an award-winning chef and pastry chef, pleasing palates from savory to sweet, and everything in between. 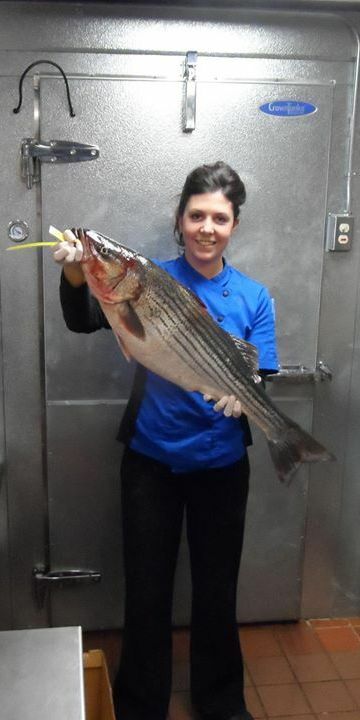 Jessica came to Skipper’s with extensive experience in front and back of the house restaurant operations which she has parlayed into a seamless kitchen operation here at Skipper’s. Her attention to every menu item is a result not only of her boundless energy and talent, but her unconditional love of the culinary arts. Amanda Willet has been a part of the Skipper’s Pier family for over 17 years. She started out as a hostess and has held every position in the front of the house. Her current role as Front of the House Manager allows her to work directly with the servers, bartenders, and all the support staff. She enjoys talking to the customers and has spent years building relationships within the community. Amanda works at Skipper’s part time while her full time job is in the education field. She has a Bachelor’s Degree from Towson University, and two Master’s Degrees; one from University of Maryland and one from Bowie State. When she is not working (which is almost never) she enjoys spending time with her husband and their 4 year old daughter, Avery! Lauren Crawford first noticed her love for baking as a little girl making Christmas cookies with her grandma. While in high school Lauren attended the Career and Technology Academy for Culinary Arts. Lauren graduated from Anne Arundel Community College with Associate’s Degrees in Hospitality Management and Baking and Pastry. She also has a certification in sanitation and alcohol awareness. 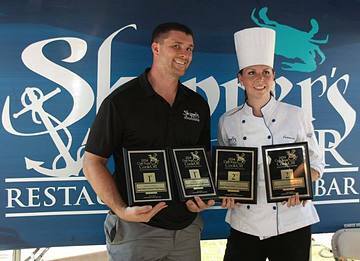 Lauren’s journey at Skipper’s began while in high school as a prep chef. She moved up through the kitchen and recently interned as a front of the house manager before assuming the position of Food and Beverage Manager.